Today I cycled to the mall, then the trail to Allen street, then back to Winsloe. I was out for a couple hours, I needed full winter dress as it was -10 with a wc of -15. I was out for a 75 minute walk today, first two pics taken at the edge of the business park. We got a light dusting of snow today, less than 1 cm. Temperature was around -11 with a windchill of -18. The sun was setting as I was on the way home. On the 25th I was out for a 40 minute walk. Another tree blew down, part of the trunk split right down to the roots. No snow left in our area but may get some tomorrow. After the rain yesterday I am back to cycling. I was cycling for a couple hours today, I cycled to Allen street and then to the bypass Hwy on the trail. Then took the Hwy to Winsloe and the road home. Sunny at -3 and a 20-25 km/h NW wind. I was snowshoeing today for a hour or so, logged 6,000 steps. #1 pic shows that a squirrel was in the tree. 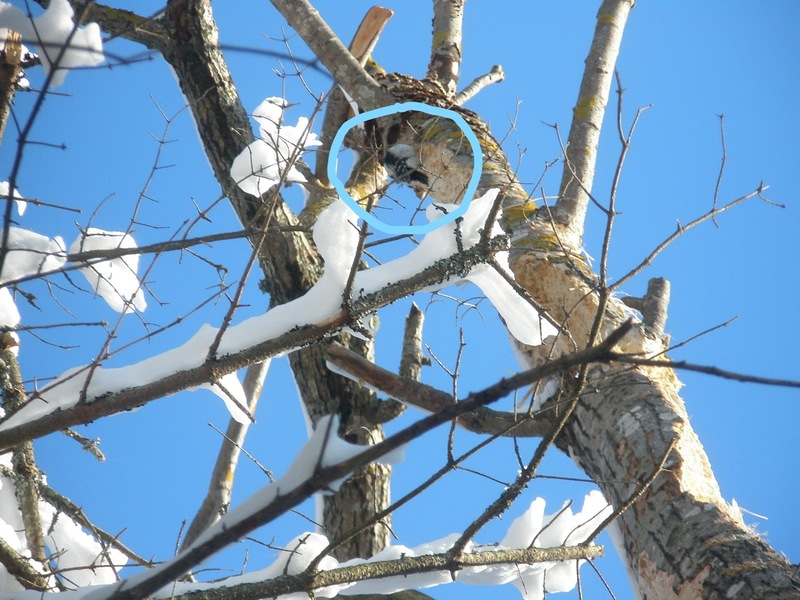 #2 shows chips on the snow which means the woodpecker is at work, it is in #3. Someone was out on the snowshoes before me which makes it a lot easy going. We had over 20 of snow yesterday. After clearing the driveway I took the Husky saw and walked to this tree, used have used the snowshoes. Took the rest of the branches off and blocked the whole tree. I was out on the snowshoes for a couple hours today, we got over 20 cm of snow since last night. So the was need of having the snowshoes. Today was a snow day so I walked to the business park and back, about 3 km. I spend a few minutes at the tree taking some more branches, small ones as I only had the campsaw. Temp at zero so it is wet snow, which does not drift. First clips taken on Friday, still some snow on trail. Near where the bee hives are location on the experimental farm. The bee hives were a art project a couple years ago. Second clips taken today, much warmer with a temp of +4 and a very light wind. Yesterday I was out on the snowshoes for 75 minutes, really didn't need the snowshoes. I was cycling for a couple hours today, temp -5. First clip is cycling on the trail near UPEI. Last clip is coming off the new highway into the roundabout and taking the York Point road exit. On Saturday I was cycling on the new highway and again today Dec10. Sunny but cold, wind chill was -15. Today I cycled from to Belvedere Ave, trail and road to Winsloe and then home. Overcast at -5 with a light nw wind. I cycled the new highway from the North River roundabout to the Clyde River, bridge not built yet. I was out for a walk yesterday though the local woods. More trees blown down and more trees to clean up. First clips taken Sunday, we had rain overnight and then sun at +5 today so a lot of the ice disappeared. I was able to cycle the last four days, today was the best day. Friday & Saturday I was just around Cornwall streets for a hour each day. Another bridge across the little creek, a good flow of water running today. I walked to the business park and this squirrel was keeping a eye on me. And the woodpecker is still working on the poplar tree. Today I walked over to the business park, this redcap woodpecker was having lunch at a dead poplar tree. I was hour for a hour and snow was hard so didn't need snowshoes. It was overcast with a light west wind and a temp of zero. Video from Nov 11 walk at wood lot looking for down trees. I was snowshoeing for a hour or more this afternoon, making fresh tracks at the edge of a field. Not far from home, I can see the Cornwall water tower on the horizon. Still lots of snow on the trees, this trail is in the woods near the ball field. I was walking in the local woods today, I used the camp saw to take limbs of this that fell partly on a trail. A misty rain at +2 and I logged 3 km. Sunday I was to the wood lot and took a walk around the lot wearing snowshoes. I have a chest mount for the GoPo. Easy to see every step that I take. I was out on the snowshoes today for a hour. I guessing about 10 cm of fresh snow. This tree fell on the trail, using camp saw I took off a few branches, next day I will take some more. The wet snow is sticking to the branches, by the forecast it will be there for a few days. We got another 15 cm of snow this afternoon, I was out for a 90 minute walk, the watch says 5600 steps. Temp was around -1 and the snow very soft. Yesterday I walked the local trail to the business park. Luckily this big tree fell away from the trail. But the trees in third photo are on the trail and will need some work with the bucksaw. Temp was -8 with gale force wind, wind chill -20.